Most cool-season vegetables, also known as “cold crops,” can withstand light frosts. Cool-season vegetables can be direct-seeded or transplanted outside much earlier than late summer favorites like tomatoes. Bhalsod explains that these plants are more frost-tolerant than others because the cool weather triggers the plant to produce more sugars, which act as a natural antifreeze for plant tissues. When this happens, we also benefit by getting sweeter tasting produce. Frost-tolerant, or “half-hardy,” plants can tolerate cool temperatures and can be seeded outdoors in early May, or about two weeks before the predicted frost date in the spring. 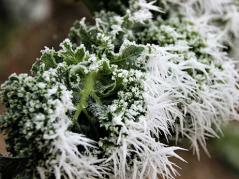 Frost –tolerant plants include cabbage, carrots, chard, and broccoli. “Be aware that the frost date is location-based, so check with your local Extension office for specific dates,” Bhalsod suggests. In general, root crops do not do well being transplanted and should be direct-seeded. Thin seedlings to three to four inches apart, but be sure to read your seed packet to learn your plants’ specific requirements. Thin seedlings when they are a few inches tall and enjoy them as microgreens, or wait until the leaves are bigger and eat the tops. Plants with a longer growing cycle should be started indoors about five weeks before planting outside. Harden plants off by gradually and progressively exposing them to outdoor conditions. This works well for crops like head lettuce, collards, kale, broccoli, cauliflower, and Brussels sprouts. Starting these plants indoors means earlier maturation and harvest. Most cold crops have two “seasons” in a vegetable garden, one in spring and again in the fall. Avoiding the high temperatures and long days of summer is key. Long summer daylight causes salad greens, for example, to produce flowers and set seed, also called “bolting,” which results in a bitter tasting, unpleasant salad. No matter what plants you decide to grow, do not forget to plan your garden to get the most out of your space. Stagger your planting times to increase your harvest period and consider intercropping different varieties or plants to maximize your production. Visit the University of Illinois Extension, “Watch your Garden Grow” website at http://go.illinois.edu/veggies, for more information.